This post should have been written on a Saturday. Yesterday, to be exact. However, I spent the past three or so days recovering from a wicked case of either heat exhaustion, or something very exotic with a 3-day recovery period, and I've not been able to think, let alone write something worthy of you, gentle readers. 1)When they talk about taking care of yourself in the heat, it's no joke! Seriously, though. A 12-year-old boy collapsed in the heat the previous Friday and unfortunately passed away. 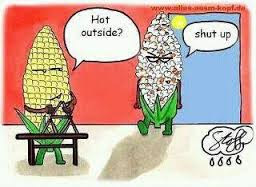 It's that hot. But I wasn't hiking, I was just doing a marathon radiator flush. At 8 am. I didn't think it was going to be my last act. But it was 112 degrees that day, and when the LOW was 91 degrees, that made it about 100 degrees, even as early as 8 am. So yeah, I'm an idiot. 2)Water! I was sweating, not really feeling distressed, but I also was just hanging around, sweating, not replenishing. But, I don't like water, and turns out Coke will dehydrate you. 'nuff said. 3) Really, just see #1 and #2. I worked Tuesday night, came home from work, prepared my stuff, kissed the husband goodbye, and went outside to work on the car. Again, just "drain radiator. Fill radiator. Run car for about 20 minutes. Let car cool. Repeat twice." I did all of that, and a trip to drive a boy to a student council meeting, and was finished around noon. Took a shower, went to bed. I woke up 6 hours later, and couldn't see straight. The room was spinning like I have never experienced before, I was nauseated, groggy and felt drugged, and there was no way I was going to work. I was contemplating calling 9-1-1, but I knew from experience that the dang paramedics would've made me try to walk myself down the stairs, and that would've made me throw up. Too undignified. So, I called in to work, cried dry little pretend tears at how terrible I felt, sucked on Otter Pops and ice chips, then water a bit later, and slept all night. I thought the next day I would feel better. Nope. Dizzy. Nauseated. It took, as I said, about three days to go all the way away. I'm actually still much more tired than usual. So, this isn't much of a writing blog--but it is a warning. When you're out there living and gathering up all of the experience to fuel that masterpiece, take care of yourself! !